Kya aap cricket game ke fan hai ?…. Tab aap cricket ke bare me achcha knowledge rakhte honge…? To ab apne cricket knowledge se real cash win kar sakte hai. bas aapko fantasy cricket play karna hoga. Jise aap CricPlay par khel sakte hai, vo bhi bilkul free. Ye dream11 ke saman hai, but kuch difference hai, jise ham aage janenge. 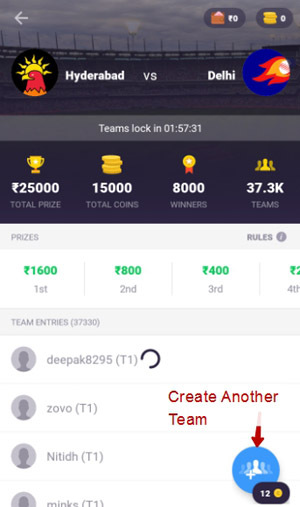 CricPlay Dream11 ke bad India ki second fantasy aur 100% free first fantasy cricket platform hai. Google play ke details according is free platform ko Times Internet Limited ne launch kiya tha. Is platform me upcoming match ke liye dono teams ke players se ek team banana hota hai. Us team me every player ke performance base par points milata hai. Match finish hone ke bad sabhi team ki final ranking banai jati hai. Usi base par cash prize diya jata hai. Jise Paytm Wallet me transfer kar sakte hai. 1.Play with the World & Win Money – aapko apni team banani hai aur uske performance ke base par real money win kar sakte hai. 2.Play with Friends & Show them You are the best – aap is platform par personal contest create kar sakte hai aur friends ko join karva kar unke sath competition kar sakte hai. 3.Daily Prediction – Every day Cric Play upcoming match se related question ask karta hai, jise aapko predict karana hota hai. Yadi aap ka answer sahi hai to cash prize win kar sakte hai, jo weekly basis par milta hai. 1.Play store CricPlay app install kare. 2.App open kare aur Get Started par click kare. 4.Ab aapke mobile par verification ke liye 6 digit pin aayega, use enter kar confirm kare. Ab aap ka account create ho chuka hai. 1.Sign up ke bad CricPlay app open kare. 2.Kisi Upcoming Match par tap kare. 3.Play cash contest par click kare. 4.Join Contest par click kare. 5.Ab aap ko dono teams ke players se apne ek team banani hai. -Aapko 1000 credit point se team banana hoga, ye point player pick karne time deduct ho jayegi. -Aapko dusri team se kam se kam 3 players pick karna hi hoga. 6.Ab next kare aur Captain – Vice Captain banaye. Dhyan rakhe Captain ko double aur vice captain ko 1.5x points milte hai, jo wining ke liye main factor hote hai. 7.Save Team kare, ab aapne successfully contest join kar liya hai. Note –Is team ko match start hone se 1 hours pahle edit bhi kar sakte hai. aur aap Current match competition home ke Plus icon par click kar second team bana sakte hai. But aapko 12 coins ki jarurat padegi. 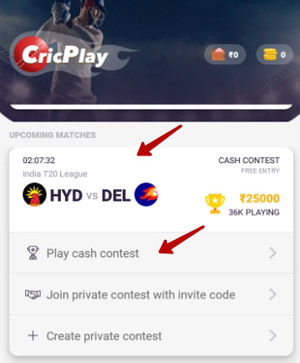 Jiske ke liye CricPlay referral program se coin earn kar sakte hai. Ise start karan ke liye sabse upar coin wallet par click kare. Ab Get More Coins>Share Code par click kare. Ab apne code ya referral link every friends ke sath share karo. 1.Right Player Chune – Contest me right players hona aapko half winner bana jata hai. Isliye aap player ki last performance aur fitness ka jarur dhyan rakhe. 2.Captain/ Vice Captain – Jis player ko captain aur vice captain banate hai use performance se consecutively 2.x aur 1.5 x point milte hai. Vahi bowler ek wicket leta hai to use batsman ke banaye 1 ran se bahut jyada points milata hai. Inhi baaton ka dhyan me rakh kar captain / vice captain banaye. 3.Pich Report – Pitch condition janana jaruri hai because pitch spin ke liye better hai to us match me spinner bowler aur jyada spin khelne vale batsman ko khilaya jayega. Cric Play 100% free hai, jaha upar bataye gaye tips aur apne cricketing knowledge se real cash win kar sakte hai. UC News padhe, vahan se aap sambhavit team ke bare me ja sakte hai.